The ITIL Capability Expert Program is designed to give you specialized knowledge of the service processes of ITIL - the IT framework that sets the international benchmark of quality for IT professionals around the world. This Masters course focuses on the practical application of OSA, PPO, RCV and SOA, the four modules that support IT operations, application management and financial management. Simplilearn’s ITIL Capability Expert program is designed to give you all the skills and knowledge you’ll need to become an IT services expert. The path to becoming a certified ITIL Service Capability Expert consists of four process oriented intermediate certifications: OSA, PPO, RCV & SOA. The courses focus on the practical application of these four modules that support IT operations, application management and financial management. This prescriptive program covers a detailed overview of the inputs, metrics, concepts, activities and outputs of each process. 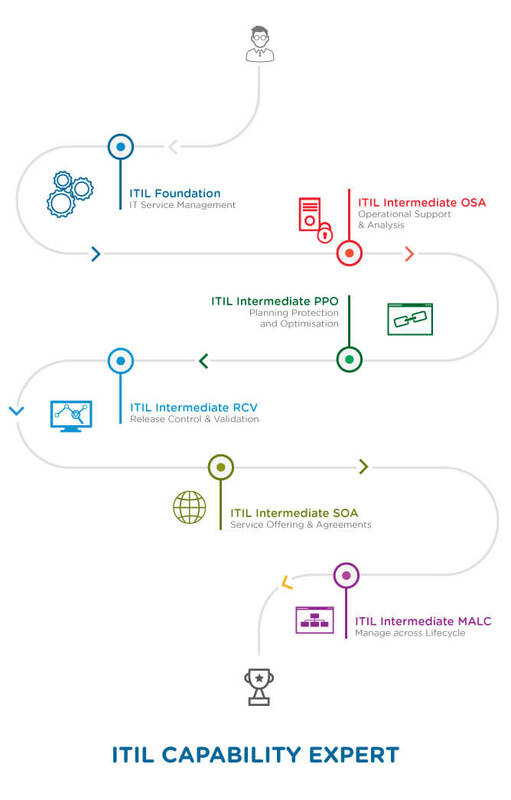 The learning path focuses on the day-to-day execution of ITIL practices and how these practices interact throughout specific phases of the service lifecycle. Completion of this program provides you with a deep understanding of ITIL processes and functions. The 63+ hours of high quality e-learning content, simulation exams and 22 credit points earned of the course of the program prepare you to become an ITIL expert. Why become an ITIL Capability Expert? Certified professionals in the IT field are in constant demand worldwide and typically earn 40% more than their non-certified peers. Professionals taking ITIL training are encouraged to come up with new ideas and approaches to improve customer satisfaction and learn to contribute effectively to service delivery in the organization. This certification gives you the critical skillsets you’ll need in the ever-evolving world of IT. Professionals in Service Catalogue Management, Service Level Management, Demand Management, Supplier Management,Financial Management and Business Relationship Management teams can also benefit from this course. How do I become ITIL Capability Expert? You will need to earn two credits from ITIL Foundation, 17 credits from Intermediates and five credits from MALC by passing the respective exams to be considered an ITIL Capability Expert. How do I enroll for the Master’s Program? What will I get with the Master's Program? You will receive access to e-learning content for all the courses included in the learning path as well as access to exclusive forums moderated by faculty and industry experts. Once you register with us for a course and pay the course fee, you will have 24/7 access to the e-learning content on our website. An automated course purchase confirmation email will guide you through the process. Yes, the exam fee is included for all of the intermediate module courses in the learning path.